Dental surgeons and dental practices with or without optical impressions, we carry out the entire dental prosthesis including the 3D modeling of crowns up to the machining of parts. We commit ourselves to produce in 4 days in the laboratory. Dental laboratory, the 3D modeling is already done, the delivery time is between 2 to 3 days. CFAO dental or implantology, our know-how accompanies you on a daily basis. We use the best techniques that exist in the field of lamination and use the best materials and components for the design and manufacture of ceramic crowns. Zirconia allows us to produce zirconia crowns with interesting mechanical properties. The zirconia crown is biocompatible to all dental environments, it cannot cause allergic reactions from the patient and therefore offers a certain comfort. It can also be pointed out that zirconia composed of 95% zirconium oxide is a hydrophilic mineral metal that provides a certain dental aesthetic unlike the traditionally used metal base crown. Natural esthetics: Compared to a conventional prosthesis, the ceramic prosthesis does not rest on a metallic infrastructure that gives the prosthesis an opaque and dull appearance. In other sectors, Zirconia has long proven what it is capable of. Whether as a heat shield in the aerospace industry, as a brake disc in the automotive industry or as an artificial joint in surgery. In dentistry, the arrival of highly resistant zirconia as an infrastructure material has opened a new path. Metal infrastructures are now largely useless. Zirconia, also known as ceramic steel, can now be used to manufacture large bridges that previously required a metal framework. Biocompatibility: Noritake ceramics are totally biocompatible. Your patients will no longer be disturbed by adverse reactions, such as the metallic taste of your current prostheses. Allergic reactions to ceramics are totally non-existent. Longevity: Ceramics have a very long life, often several decades. Low thermal conductivity Unlike metal which is heat conductive, ceramic acts as a thermal insulator. Even with sensitive teeth, no irritation is to be feared when hot and cold. Safety: Noritake brings you safety because this material has been clinically proven millions of times over for more than 15 years. The long service life of Noritake restorations is based above all on the high strength of the Zirconia infrastructure. Real innovations make daily work more successful. We take no risks with the materials, each material used in our laboratory must meet standards of strength and reliability. With Zirconia Y-TZP ZR2 O2 practitioners are not obliged to change their preparation and sealing habits. The Y-TZP ZR2 O2 Zirconia can be used for single to full bridge work. This technique has proven itself for more than 20 years and is the reliability solution par excellence. The preferred zirconia that has been isostatically pressed and not uniaxially pressed is already very dense. This Zirconia is suitable for unitary work, medium-span, large span bridges, inlay-onlay and veneers. Among our industrial machines, the Datron machine offers us a unique, precise and efficient machining capacity. 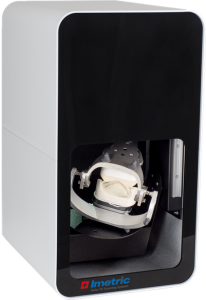 Developed by and for dental technicians, the Datron machine allows PMMA handling such as: cobalt chrome, titanium and zirconia. High performance control software, good cutting quality, high range spindles, Datron machine offers incomparable production quality.